Dundee might be the biggest and most expensive Super Bowl commercial in history. A new trailer reveals that Danny McBride, Chris Hemsworth, and Hugh Jackman are not alone in this crazy project. Margot Robbie, Isla Fisher, Ruby Rose, Liam Hemsworth, and Russell Crowe are now involved in this crazy promotional stunt for Tourism Australia. It's a shame that this is a commercial because it looks like it could make for a pretty entertaining movie with this all-star cast assembled. Everybody is here, so where is Paul Hogan? He's actually been spotted, but not in the trailer; more on that in a moment. 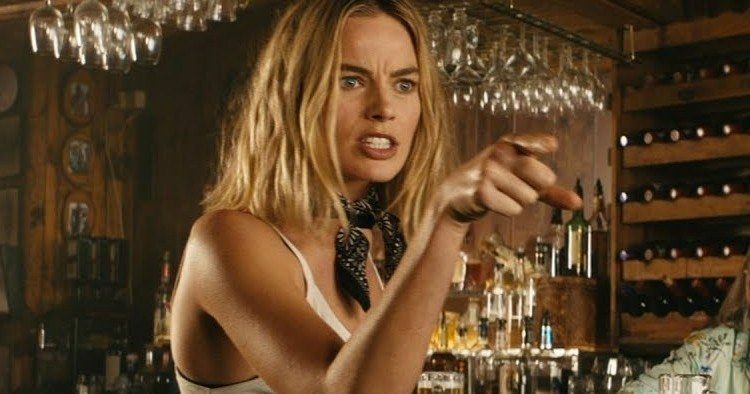 Danny McBride's Brian character is seen playing the didgeridoo like a guitar and we learn that his mother's side of the family were jazz musicians while Margot Robbie is seen chanting "free beer" in a bar after throwing a man into some chairs for dissing Mick Dundee. There's baby kangaroos with Isla Fisher, some walkie talkies with Ruby Rose, and something evil going down with Russell Crowe who is the villain of this insane Super Bowl 2018 commercial. Some serious work went into this and it looks like it's still going on. Not much goes under the radar, but the Dundee project got a whole lot of A-list actors together in secret, which is pretty crazy to think about. IMDB says that the budget for the project is $30 million and it is starting to look like that all went into casting and filming this behemoth. Additionally, it costs $5 million per 30-second spot to air during the Super Bowl, and this certainly looks like it will have to be a lot longer than 30 seconds. While we haven't seen any footage of Paul Hogan as Crocodile Dundee yet, Margot Robbie did post a picture of herself and the iconic actor on the set. It isn't clear when the picture was taken, but Robbie suggests that it was a while back because she tagged the picture as a throwback. It seems that it's only a matter of time before we see Brian Dundee finally find is father in the Australian Outback. It will be very interesting to see how Paul Hogan and Danny McBride work together, since it's definitely not something that anybody has ever thought of. The Dundee Super Bowl 2018 commercial is shaping up to be something pretty crazy and may even be a short film that gets released on the day of the big game. So far, we've seen about 5 minutes of footage, which leads us to believe that there is plenty more. While we wait to figure out the full scope of this epic commercial for Tourism Australia, check out Margot Robbie's Instagram picture of herself and Paul Hogan and watch the new trailer for Dundee featuring Robbie, Russell Crowe, Isla Fisher, Ruby Rose, Hugh Jackman, Liam Hemsworth, Chris Hemsworth, and Danny McBride below, courtesy of the Dundee Movie YouTube channel.